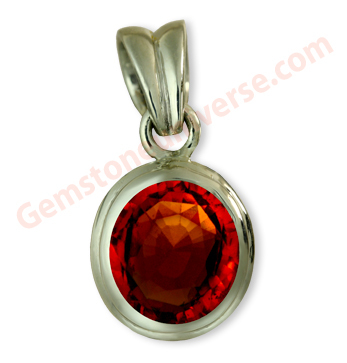 Comments This Hessonite pendant turned out to one of the best Rahu Talismans we have provided. Sri Lankan Hessonite also known as Cinnamon Stone and Gomedh is the Gemstone of the Karmik Planet Rahu. Calibrated Oval Cinnamonstone. Solid 4+ Carats, all natural and treatment free Ceylon Hessonite exhibiting the orange fire of a thousand Suns. Hessonite is the Gemstone of the sacral chakra and helps removes fears, complexes, confusion and provides great clarity and enhanced decision making capacities to its wearer.